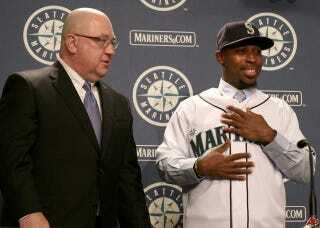 Seattle Mariners third baseman Chone Figgins is currently batting .202 on the season. Hitting a notable .087 this past week, manager Eric Wedge sat Chone on the bench for last night's game against the Yankees. There's chatter of moving him down in the lineup; like No. 9 down. "It's tough. Guys are doing good," Figgins said. "I'd like to be a part of it more consistently. I've been there through a bunch of it. I'd just like to be more consistent. But it's a great thing they're winning. You'd just like to be more a part of it than just a little bit." Seems like it's been tough on him, and justifiably so. But there's a side benefit here: Patrons of Norm's Eatery and Ale House in Seattle would like to see him do worse so their Widmer beer prices remain at Crazy Eddie insane-price level on Monday nights. Norm's has been known for their Monday night promotions based on Mariners struggles. They held a similar promotion a few years ago, in which beer prices were based on former Mariner Richie Sexson's batting average. Last year, they held a food and beer special called "Milton's Meltdowns," which were based on Milton Bradley's headlines on and off the field.